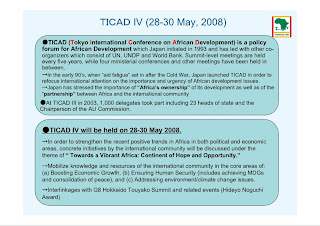 the 4th Tokyo International Conference on African Development. the Africa-Asia NGO network has blog with some info in English about thier priorities and what issues they hope to tackle. the TNnet (TICAD IV･NGO ネットワーク - TICAD 4 NGO network) also has info on thier work but this is in Japanese only. * The Millennium Project recommends that private sector firms and organizations should contribute actively to policy design, transparency initiatives and, where appropriate, public-private partnerships. 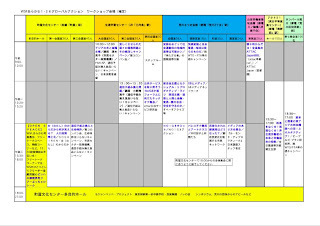 More and more information is starting to appear on the NGO Forum website in E as well as Japanese. Platforms and reports from each group (poverty and development, human rights, and environment) are now posted in both langauges was well info on meetings and upcoming events. there have been several articles in a number local papers these days trying to address the issue of the decline in population, immigration reform and the possibility of increased immigration in Japan. Seems like this has been one of those areas where no has wanted to connect the dots until now when we know how few young Japanese people there are and there is no going back. Finally nonJapanese might be included in future plans of the country. Japanese tax base dropping ? I recently got an email about what I meant when I recently wrote that the Japanese tax base is declining. We have more and more people livening longer and longer. At the same time we still have a declining birth rate. Therefore, there will be fewer workers paying more taxes to support more people. This is a critical year for Japanese ODA because from now on end many expect it to go down due to the increased local needs (in particular health care and social services for elders.) If Japanese aid is drastically reduced this will of course affect Japanese NGOS working in international development projects but it will also affect the visibility and power of Japan overseas. You can even go on to the OECD webpage for reports on the fiscal impacts of the population imbalance in Japan. Some of the measures they write about are still not in place but some of the studies do show the need for a stronger civil society. Citizens all over the world are responding with local events. The eighth World Social Forum in 2008 won't be organized at a particular place, but globally, which means by thousands of autonomous local organization. Expect to read more hear about what is going on! I am coordinating a group of people for the development of a large (400-500 people) party next summer to support local organizations and hook them up with supporters. All are joining on a volunteer basis and planning in earnest starts at our Jan 25 meeting. We are looking for people for all committees - pr/outreach, sponsorship, financial mgt., logistics, food and drinks. Sorry - no website yet. we are looking for someone to do that too.